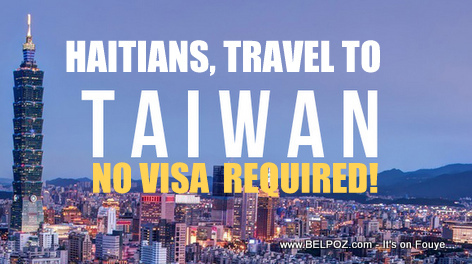 Haitians Travel to Taiwan, NO VISA Required! Taiwan president Tsai Ing-wen and Taiwan's Foreign Ministry on Wednesday announced visa-free entry for citizens of its 11 diplomatic allies in Latin America and the Caribbean, effective immediately. If you are from Haiti you can stay visa-free for up to 90 days. To be let in, Haitian citizens must present a passport that is valid for at least six months. You also need a return ticket or a ticket plus visa to another destination. Read this from The China Post. How they could immigrate themselves up there? Have a legal status and they could do whatever they wanted to in positive way? It's really a great opportunity for haitians to discover and explore the world. But i wish they ain"t do it like they did over chile. Because we have alot of graduated school person in haiti not doing anything really, so they could use that to go overthere learning something. Haiti seems to have good relationship with Haiti. The CNE is a cooperation to better the agriculture of Artibonite. The partnership is with Taiwan among others. There is something wrong just happen to let them open just like that hmmm something smells fishy. It's sound good but what's behind it we should think about too. It's just too good to be true.